Afterward Joseph of Arimathea, who had been a secret disciple of Jesus (because he feared the Jewish leaders), asked Pilate for permission to take down Jesus' body. When Pilate gave permission, Joseph came and took the body away. With him came Nicodemus, the man who had come to Jesus at night. He brought about seventy-five pounds of perfumed ointment made from myrrh and aloes. Following Jewish burial custom, they wrapped Jesus' body with the spices in long sheets of linen cloth. 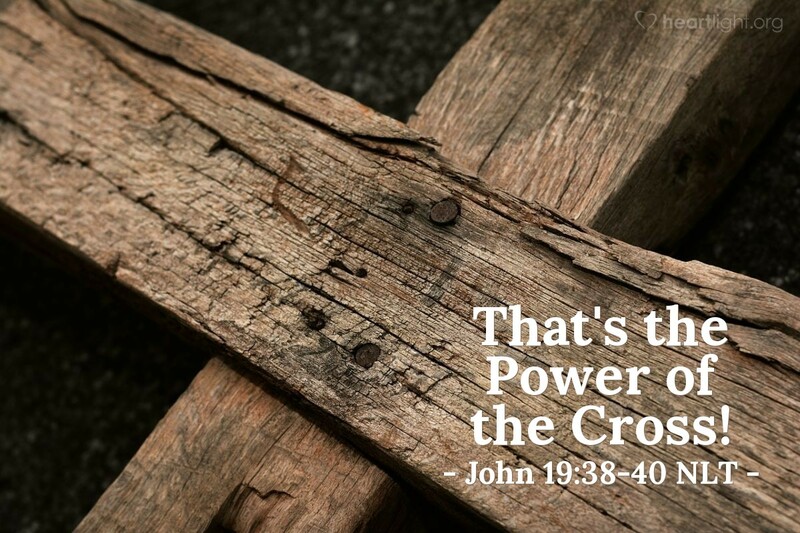 Jesus had promised that the cross on which he would be "lifted up" would be the power that would draw all sorts of people to him in faith (John 12:32). Jesus had even told Nicodemus: "And as Moses lifted up the bronze snake on a pole in the wilderness, so the Son of Man must be lifted up, so that everyone who believes in him will have eternal life (John 3:14-15). For Nicodemus, Jesus' crucifixion — Jesus' being "lifted up" — was his deciding moment of faith. On the human side of things and in the view of the Jewish religious leaders, Jesus' crucifixion was absolutely the worst time for Nicodemus to identify himself with Jesus. Jesus had just been convicted — falsely convicted, but still convicted — of a vile crime by the Roman authorities and rejected by Nicodemus' peers, the Jewish ruling council. Despite the direst of possible consequences, Nicodemus stepped forward and did the loving work of burial preparation. This preparation was something the closest family members of the deceased would normally do. Nicodemus' taking part in the burial of Jesus made him unclean for the Passover celebration. Furthermore, his actions were political suicide. He was now openly identifying himself as a disciple of Jesus along with Joseph. He could be put into prison because of this association with Jesus. The cross and the sacrifice of Jesus, however, drew his heart to follow Jesus. The fulfillment of prophecies about Jesus and his own words called forth the courage of both of these men when they had everything to lose. In this moment of decision, Nicodemus stepped out of darkness into Jesus' bright light (John 3:19-21). In the process, these two influential and respected men provided the early disciples another incredibly important blessing: They could testify that Jesus had actually died. They had prepared his dead body for burial and placed it in the tomb! Father, thank you for the touching story of Nicodemus who had previously come to Jesus during the night with questions about his identity. As Jesus hinted in his reply to this great teacher, Nicodemus began to unlock the real identity of Jesus with the Lord's crucifixion. Now, dear Father, I rejoice that Jesus' sacrifice on the cross has led me to know your love for me just as surely as it challenged Nicodemus to fully identify with Jesus. Empower me with the Holy Spirit to be willing to risk everything for my Lord. Amen.